OVERVIEW: The Southern Plains Transportation Center and the Oklahoma Department of Transportation (ODOT) hosted the Oklahoma Transportation Re-search Day (OTRD) in October in Oklahoma City. The event presents and demonstrates new research and technology development. It consists of oral presentations, poster presentations, discussions, demonstrations and identification of potential research topics for ODOT, Oklahoma Turnpike Authority (OTA), Federal Highway Administration, and other transportation stakeholders. Eligible participants had the opportunity to receive eight (8) Professional Development Hours (PDH). EVENT DETAILS: One-hundred and sixty eight (168) guests were in attendance. They represented academia, state/federal agencies, tribal organizations, and the private sector. National speakers addressed a wide range of topics within the subjects of Freight and Safety. The keynote speaker was Elizabeth Alicandri, Associate Administrator of the US Federal Highway Administration, whose talk entitled “Turning Safety Re-search into Saving Lives” presented methods for implementing research into every day processes. Some of the additional guest speakers included Stan Caldwell, Executive Director for Traffic21 Institute, Carnegie Mellon University, Henry Brown, P.E., Research Engineer, University of Missouri, Alan Stevenson, Assistant Division Engineer for ITS and Operations, Oklahoma Department of Transportation, David Yarbrough, Director, Tulsa Port of Catoosa, City of Tulsa-Rogers County Port Authority, Craig Moody, Rail Programs Division Manager, Oklahoma Department of Transportation, and Caroline Mays, Director, Freight and International Trade Section, Texas Department of Transportation. Closing remarks were made by Mike Patterson, Secretary of Transportation and Executive Director of Oklahoma Department of Transportation. The Equipment Demonstration Session featured equipment technologies such as a Concrete Tag (Ctag) by Dr. Tyler Ley, and the TCMS for Traffic Data Collection created by Dr. Hazem Refai. Dr. Joshua Li provided his Quantum Imager Triple Frequency Ground Penetrating Radar (GPR) and the Olson Light Weight Deflectometer (LWD) (pictured below). Dr. Julie Hartell demonstrated the Ultrasonic Pulse Velocity and Rebound Hammer and the Surface Resistivity and Pulse-echo Imaging Machine. Dr. Anol Mukhopadhyay demonstrated the abilities of the Accelerated Concrete Cylinder Test and the Volumetric Change Measuring Device. Matt Romero provided the MIT Scanner from ODOT. Dr. Ron Barnes presented web-based systems: SAFE-T (Statewide Analysis for Engineering and Technology) and OKRoads (Oklahoma Road Conditions). Students showcased their research and competed in poster presentations for cash prizes which were provided by the Oklahoma Center for the Advancement of Science and Technology (OCAST). A total of 25 poster submissions were entered the competition, with several projects reflecting collaborative research within the SPTC consortium. Poster competition winners were selected by a panel of independent judges based on the student’s ability to (a) concisely explain the research, (b) the organization and visual appeal of the poster, and (c) the clarity of the three-minute video that was submitted by the student explaining the research and its relevance. Second place was awarded to Ning Lee, Oklahoma State University for her work entitled, “Laboratory Test on Slab/Base Friction in Concrete Pavement.” Third place went to Ahmed Gheni, Missouri S&T, for his work entitled, “Innovative Eco-Friendly Crumb Rubber Chip Seal Pavement”. IMPACT: The ODOT-SPTC Oklahoma Transportation Research Day (OTRD) is a major technology transfer event in Oklahoma that enhances collaboration between transportation stakeholders. OVERVIEW: Improper compaction during construction is one of the leading causes for the early deterioration of asphalt pavements. Current quality control techniques used during construction are time-consuming and typically test less than 1% of the constructed pavement. Intelligent Compaction (IC) of soil and asphalt mixes is an innovative approach that has been utilized to achieve uniform, adequate compaction of pavement layers during construction, with real time knowledge of the level of compaction achieved. The Federal Highway Administration (FHWA) has drafted Generic IC specifications for soils and asphalt pavements to facilitate the early adoption of this technology. These generic specifications are expected to serve as guidance to individual state Departments of Transportation (DOTs) in the development of specifications relevant to the respective states. CURRENT RESEARCH: In this study, the researchers from the University of Oklahoma (OU) worked with the Oklahoma Department of Transportation (ODOT) to develop and validate “Special Provisions” for the use of IC rollers during compaction of stabilized subgrades. The Intelligent Compaction Analyzer (ICA) was developed in previous projects based on the hypothesis that the vibratory roller and underlying layer form a coupled system. Vibration features are extracted from the field data and used to predict the level of compaction using a trained neural network. Different components of the ICA integrated vibratory roller used during the compaction of a stabilized subgrade are shown in Figure 1. In the ICA system, an accelerometer is mounted on the frame of the roller to record the vibrations of the roller during compaction. These vibrations are processed in real-time using signal processing techniques to deter-mine the harmonics. These harmonics are then used to estimate the density or modulus of the material being compacted using a trained neural network. Global positioning system (GPS) receivers are used to record the spatial location of the roller at each instant. These read-ings provide as-built maps showing process information such as number of roller passes, roller path, and density or modulus to the operator, in real-time. This project produced specifications (“Special Provi-sions”) for the intelligent compaction of stabilized subgrades that address IC rollers, GPS and data recording, Quality Control Plan, IC calibration and verification procedures, establishment of target IC-MV, and statistical acceptance testing and verification of IC-MV values re-ported at test locations. The specifications also address the verification of adequate site preparation prior to the construction. The specifications were validated, reviewed, and modified through two different field projects. The research team in collaboration with ODOT identified two suitable field projects on Highway 9 and US-77 in Norman, Oklahoma. Virgin soil samples were collected from the job sites and brought to the OU Broce laboratory for testing. The stabilizers used in the Highway 9 project were cement kiln dust (CKD) and lime. The properties of the virgin soil and stabilized soil samples were studied in the laboratory. Required tests as indicated in the draft IC specifications were conducted for characterizing the modified soil mixture prior to the compaction. The sub-grade soil was stabilized by mixing 12% CKD and 2.75% Lime to a depth of 200 mm (8 inches) in the field. The optimum moisture content (OMC) and maximum dry density (MDD) of the stabilized soil were found to be 13.1% and 17.6 kN/m3, respectively. To validate the IC specifications, comparisons were made between the resilient modulus obtained from the regression models based on laboratory test data and ICA calibrated resilient modulus (Figure 2). It was not possible to conduct resilient modulus tests for every single variation in moisture content and dry density. There-fore, a separate regression model was developed for the resilient modulus as described in the developed specifications. The regression model was helpful in predicting the equivalent resilient moduli at different points in the field as a function of moisture content and dry density (within a specified margin of error). As shown in Figure 3, a good correlation was observed between the laboratory-measured resilient modulus and the IC-calibrated modulus. The R-squared value was higher than 0.65. These results indicate the effectiveness of the developed specifications in compaction of soil subgrade pavement layers. IMPACT: Intelligent Compaction is expected to result in the construction of higher quality and longer lasting pavements. This project led to development of specifications that are expected to help facilitate implementation of this technology. Dr. Sesh Commuri is the Principal Investigator (University of Nevada, Reno). Drs. Musharraf Zaman, Amir Arshadi, Syed Imran and Manik Barman are Co-Principal Investigators on this project. Please send any inquiries to scommuri@unr.edu. OVERVIEW: According to the American Society of Civil Engineers, Arkansas roads cost residents $634 million a year in extra vehicle repairs and operating costs, moreover 39 percent of Arkansas roads are in poor or mediocre condition. To reduce both of these numbers, the Arkansas State Highway and Transportation Department and other DOTs/highway departments must develop or implement techniques to plan and budget for roadway repairs and future replacement. Effective methods will yield robust measurements while being conducted in a rapid, non-destructive manner that minimizes traffic disturbance. Currently, there are some nondestructive tests (NDTs) in practice that are rapid and produce robust results, but only the spectral analysis of surface waves (SASW) and the multichannel analysis of surface waves (MASW) directly (i.e., not through a correlation) produce physical properties of a material such as shear modulus. SASW was originally developed to test pavements, but it has several limitations in that it cannot detect higher modes and the data processing method requires substantial time and skill. MASW was developed as a continuation of SASW and improves on the deficiencies of SASW. There is extensive research on MASW testing for soils but little research has concentrated on pavements. The purpose of this research is to test four parameters (source type, source offset, receiver spacing, and number of receivers) used in MASW field testing to determine the optimum testing procedure for pavements. Additional research was conducted to determine the ability of MASW to measure a degradation in shear wave velocity due to an increase in material damage. RESEARCH SUMMARY: The MASW testing procedure involves a seismic source that generates surface waves and accelerometers that measure the propagation of that wave across a surface. It is a multichannel method (i.e. 24 receivers) that records data in the space-time domain. The general procedure is shown in Figure 1. The MASW optimum field testing parameter phase of this research focused on three materials common in transportation: asphalt, concrete, and soil. There were two asphalt sites (“CTTP Asphalt” and “ENRC Asphalt”), two concrete sites (“ENRC East Concrete” and “ENRC West Concrete”), and one soil site (“CTTP Soil”). All of the sites are located at the University of Arkansas Engineering Research Center located in Fayetteville, Arkansas. In addition, research was also done on the effect of lateral variability on Rayleigh wave propagation. This was accomplished by constructing a box with dimensions of 1.22 m wide by 2.44 m long by 2.44 m deep with a cast-in-place (CIP) concrete wall along one of the 2.44 m long walls. The final portion of the research focused on examining the relationship between a degradation in shear wave velocity and material damage. First, concrete prisms were constructed in accordance with ASTM C1293. There were three groups of prisms constructed, one being a control and the other two containing varying amounts of Jobe sand, which is known for causing alkali-silica reaction (ASR). Second, the ability of MASW to detect a degradation in shear wave velocity as material damage increases was determined. This was accomplished by testing three sites located on a barrier wall along Interstate 49 south of Fayetteville, Arkansas. These three sites (known herein as “C-1”,”C-2”, and “C-3”) have varying levels of reactivity and their strains are currently being monitored. RESULTS: It was determined that for the data collected on asphalt, the optimum procedure included a 230g metal-tipped hammer, 2.5 cm receiver spacing, a minimum of 24 receivers, and source offsets of 12.5 cm, 25 cm, and 50 cm. For concrete, the optimum procedure included a 230g metal-tipped hammer, 5 cm receiver spacing, a minimum of 18 receivers, and source offsets of 12.5 cm, 25 cm, 50 cm, and 75 cm (Figure 2). For soil, the optimum procedure included a 230g metal-tipped hammer, 5 cm receiver spacing, a minimum of 12 receivers, and source offsets of 12.5 cm, 25 cm, and 50 cm. Additionally, it was determined from a limited data set of six tests, that MASW has the ability to detect a decrease in shear wave velocity as damage increases up to a strain level of at least 0.09% (Figure 3). However, MASW testing done on concrete with expansions of 0.09% and 0.29% showed only a 2% difference in shear wave velocity between the two large strain sections. Given the data collected it cannot be determined if MASW can be used to differentiate between concrete sections with strains larger than 0.09% (i.e., sections with heavy damage). About the Researchers: Dr. Clinton M. Wood from the University of Arkansas (UArk) – Department of Civil Engineering served as Principal Investigator. Masters student Benjamin Davis served as graduate research assistant for the work. OVERVIEW: Langston University hosts the Langston University Transportation Academy (LUTA) annually. The primary objective is to attract a diversified group of young people into the transportation workforce. Few minorities enter transportation professions. To increase diversity of future transportation professionals in the United States, it is necessary to deliver intervention efforts that are geared toward encouraging underrepresented students to take academic courses in science, technology, engineering and mathematics. It is advantageous for young people to be recruited early in secondary school and exposed to career choices and opportunities in the transportation industry. Therefore, the academy has three related objectives: (1) to create awareness of and stimulate interest in career opportunities in the transportation industry; (2) to attract a broad and diverse selection of bright minds, and acquaint and stimulate them with the various aspects of the transportation industry; and (3) to increase the number of students who choose careers in the transportation industry. Promoting fast, smooth, and safe transportation is one of the underlying themes of the Langston University Transportation Academy. LUTA curriculum generally involves learning about land, air, water, and space transportation, and how these modes of transportation interface with each other. Also, students hone their computer, math, chemistry, and communication skills. LUTA was conducted from May 29 to June 10, 2016. Under the supervision of Chongo Mundende (Director of LUTA) and Marshan Oliver-Marick (an Associate Director of SPTC), seventeen students completed the academy. The following sections provide a brief overview of activities. Water Transportation: Water transportation is limited in Oklahoma; however, students learned about the transportation of goods and services via waterways. Students traveled to the Port of Catoosa Authority that operates the McClellan–Kerr Arkansas River Navigation System (MKARNS). Students observed the intermodal concept of transportation first hand. They saw trucks bring in or take away freight, the train move freight, and the barges being unloaded or loaded. Land Transportation: Students learned about careers in land transportation through classroom presentations, field trips and hands-on activities. Students interacted with engineers who discussed bridge and road design, transportation planning and traffic control. They also learned about the No Zone and defensive driving in addition to experiencing driving under the influence through a simulated car and driving course. Students constructed bridges using popsicle sticks and glue, which were tested to determine the amount of load they could carry. The participants were grouped in pairs. Working together, students were asked to design the bridge, estimate the number of sticks they needed, and then construct the bridge they had designed. Only one bridge failed at 39 pounds of loading. The rest did not fail when the maximum 60-pound load was applied. Students visited the SPTC and constructed ramps that were tested for navigating a ball without leaving the ramp or breaking when rolled from the top to the bottom of the ramp. Led by SPTC staff and engineering students, the ramps were judged based on pre-selected criteria. All students were required to use the materials provided, which included the same number of blocks. The designs varied greatly and had different results underscoring the variation in engineering techniques and need for design and testing. Additionally, students had opportunities to assemble a robotic car (Figure 2). Students were instructed about car components and functionality, including design. This activity proved valuable in teaching students time management, teamwork, design and construction. Air and Space Transportation: Students experienced many facets of air and space transportation through three separate, but related field trips. At the Oklahoma City Metro Aviation Career Center, students learned about the history of aviation and the various career opportunities offered even to high school students, particularly in mechanics. At the Mike Monroney Aeronautical Center, students learned about air traffic control, plane crash investigations, plane inspection procedures around the world, and safe evacuation procedures during emergencies. At the Spartan College of Aeronautics and Technology, students learned about certifications and degrees offered, as well as career opportunities available after attending the college. The students enjoyed working with engines best based on feedback. charge of the interactive program. Instructors and counselors presented awards for classroom engagement, which included awards for math, communication, computers, sports and recreation, and overall performance. Another student wrote: “I have learned a lot of stuff, whether in class or on a field trip. LUTA has introduced me to the world of transportation. Every day I learn new things. I have enjoyed the trips. We have been to places like the FAA and Port of Catoosa. I am happy that I got to meet new people because they have taught me a lot. About the Academy Director: D. Chongo Mundende of Langston University is the LUTA Director. Please send inquiries to dcmundende@langston.edu. OVERVIEW: Aging or deterioration of the nation’s bridge infrastructure is a significant issue that requires attention, especially for bridges subject to extreme environments and a changing climate. Causes for much of this deterioration are attributed to corrosion and metallic fatigue, both of which work together to reduce the strength and service-ability of bridge components over time. In many cases, strengthening of the locally affected bridge components using localized retrofits is an economical and fast alternative to complete bridge replacement. The objective of this research was to increase the understanding of corrosion effects in prestressed concrete bridges and longevity of existing steel bridges subjected to corrosion induced deterioration and metallic fatigue. RESEARCH SUMMARY: This project consisted of analysis and experimental testing of steel bridge details susceptible to fatigue and end regions of precast prestressed concrete girder ends subjected to reinforcement corrosion. Locations most affected by fatigue were identified and detailed analyses were conducted for four bridges (Figure 1). The steel bridges portion of the research was conducted in two parts. Part 1 began with an investigation of common bridge types within Region 6 and a selection of four distinct bridges for analysis. Next, detailed finite element models simulating all bridge connection geometries were analyzed, considering the American Association of State Highway and Transportation Officials (AASHTO) Fatigue I Load Model. Finally, stress analyses were conducted and local stress ranges were characterized to determine the location of fatigue-critical connection details within each bridge. In Part 2, localized fatigue retrofits capable of extending the steel component fatigue life were developed using prestressed carbon fiber reinforced polymer (CFRP) materials. Part 2 began with the development of the retrofit configuration, then a fatigue evaluation was conducted on the critical fatigue detail in each bridge based on the Goodman fatigue criterion and the retrofit configuration. Finally, the retrofit was tested on a welded diaphragm to girder connection detail in the laboratory. The Goodman fatigue evaluation showed that skewed bridge construction is more damaging to the steel cross-frame-to-girder component fatigue life than non-skewed construction. Using the Goodman criterion, the prestress force required to shift a structural detail from a state of finite fatigue life to infinite fatigue life increases linearly with the applied stress range; however, the magnitude of the prestressing force is dependent on the size of the steel member cross-section. Laboratory tests were successful in shifting the mean stress in an instrumented steel beam using the localized prestressed CFRP retrofit. Although this experiment only provides a preliminary evaluation of the retrofit performance, the results indicate that the retrofit is capable of reducing the mean stress of structural details therein improving fatigue performance. The concrete portion of this research project was divided into two sections: lab experiments and field inspections. Lab experiments to accelerate corrosion in end regions of half-scale AASHTO Type II girders that replicate girders from a bridge taken out of service in 2013 (I-244 bridge over the Arkansas River in Tulsa County) were conducted. Nine girders were constructed with an emphasis on consistency with the original design and engineering properties. One end region of each girder was exposed to an accelerated corrosion process. Three different levels of corrosion exposure were applied to the nine girders to illustrate varying environmental conditions. Six of the girders were shear tested with end zone deterioration. Shear tests resulted in measured shear values less than the design shear capacity for each girder (Figure 2). The corroded ends of the members exhibited larger measured shear strengths, and exhibited earlier bond loss than the control ends. The exact significance of these results is unclear, but the results indicate an effect of strand corrosion on the failure mechanism. Further research including additional deterioration levels is necessary to clarify the results. Concurrently with the lab experiments, efforts were placed on inspecting similar bridges to those used in the research project (bridges with AASHTO Type II prestressed girders constructed in the 1960s and 1970s) to identify varying levels of visible corrosion deterioration. During the inspections, various deterioration characteristics were found at multiple sites. Those deterioration characteristics included: corroded bearing plates; corroded anchor bolts and nuts; spalling above the support; exposed rebar and prestressing strands; diagonal cracking of the back corner of the girder; vertical cracking along the girder and diaphragm interface; diagonal cracking from the top flange and web interface; and diaphragm deterioration. These common deterioration characteristics did not appear to correlate directly with the superstructure ratings. IMPACT: The research addressed problem areas for corrosion and fatigue in the two most common type of bridge structure in Region 6. The localized retrofits have the potential to extend the life of in-service steel bridges subject to damage from fatigue at cross-frame details and are almost instantly implementable. However, additional research is warranted to identify methods for reducing prestress losses in the retrofit and in surface preparation for mounting. A number of common deterioration characteristics were noted for prestressed concrete girder ends for in-service bridges in Oklahoma. Several potential steps could be implemented to reduce the impacts of this deterioration. These include ensuring proper functioning of expansion joints to prevent exposure of the girder ends to deleterious materials and coating bearing plates, anchor bolts, and nuts. About the Researchers: Dr. Royce Floyd from the School of Civil and Environmental Engineering at The University of Oklahoma (OU) was the Principal Investigator, and Dr. Gary S. Prinz from the University of Arkansas (UArk) – Department of Civil Engineering served as Co-Principal Investigator. Masters students in the School of Civil and Environmental Engineering at OU, Korey Pough and Darion Mayhorn, also contributed to the project. OVERVIEW: The importance of managing transportation assets is essential to retain the value of the initial investment. Currently, engineers around the world are creating innovative solutions to manage infrastructure. Since its inception at the University of Waterloo in August 2005, The Annual Inter-University Symposium on Infrastructure Management (AISIM) has critically contributed to graduate education. Not only has it been an avenue for students to exchange both knowledge and research ideas with their peers (including internationally), it has also provided an opportunity for students to interact with global leaders in the field of transportation asset management. The 4th Advanced Infrastructure Management (AIM4) “Bootcamp” was also held in conjunction with AISIM12. EVENT SUMMARIES: This year, the 12th AISIM (AISIM12) was held at Oklahoma State University (OSU) in Stillwater, Oklahoma in June 2016. It commenced with a workshop entitled, “How to work with a social scientist” delivered by Alex Greer, an Assistant Professor in the Department of Political Science at OSU. Some of the symposium participants are shown in Figure 1. Fifteen presentations were organized around four topics: asset performance, data for asset management, statistical analysis, and decision making. David Ooten, ODOT Division Engineer for Strategic Asset and Performance Management Division talked about Asset Management Implementation in the Oklahoma DOT. James Bryce from AMEC Foster Wheeling, an AISIM alumnus, provided an overview of his experience while working in industry. Awards for best paper were presented. The five best papers were invited to present at the Transportation Research Board (TRB) 96th Annual Meeting in Washington D.C. The 4th AIM “Bootcamp” was also held at OSU in conjunction with AISIM12. The objective of this two-week long intensive course was to provide an opportunity for students to gain in-depth knowledge about advanced infrastructure management, acquire related management skills, and develop a mini-project. It also provided a platform for students to network with others with similar interests in Civil Infrastructure Management. The bootcamp brought together 13 students, a visiting professor from China and 8 instructors. The students and instructors came from Georgia Tech, Purdue University, Texas A & M, Virginia Tech, University of Delaware, University of Iowa, and Oklahoma State University. International students from China, Japan, Germany, and Switzerland also participated. The course covered performance and asset management, sensors and instrumentation, deterioration modeling, data management, sustainability, risk and reliability, asset valuation, public-private partnership, optimization, and research methods. Some of the participants are shown in Figure 2. Students participated in lectures and completed homework and a final project. IMPACT: The AISIM12, a graduate student focused, graduate student organized event, provided a welcoming environment for graduate students working in infrastructure management to present their research, build a network of peers, and gain experience. Bootcamp provided an opportunity for students and practitioners to have an immersion experience in an advanced Infrastructure Management course that focused on physical assets. About the Researchers: Dr. Joshua Q. Li from the School of Civil and Environmental Engineering at Oklahoma State University (OSU) organized the event and Professor Sue McNeil from the University of Delaware (an ASCE T&DI committee member and former chair of the ASCE Infrastructure Systems Committee) led the class. Support for AISIM and Boot Camp came from the Southern Plains University Transportation Center (SPTC), AMEC Foster Wheeling, the School of Civil and Environment Engineering, the College of Engineering, Architecture and Technology at OSU. The activities were also supported by the Infrastructure Systems Committee in TD&I of ASCE. OVERVIEW: Highways and bridges are key infrastructure that require regular maintenance. According to Federal Highway Administration estimates, there are over 600,000 bridges and 4 million miles of highway across the United States. Regular maintenance of these key infrastructures have significant economic impacts. This SPTC-funded project, through The University of New Mexico (UNM), has been researching polymer concrete modified with nanoparticles as an alternative material for repair and overlay. Polymer Concrete (PC) is a type of concrete that replaces cementitious binders with polymer. It can serve under severe weather conditions, has rapid curing, and can develop a strong bond with steel or concrete. The findings show that incorporating small weight fractions of nanoparticles into the PC matrix improves the mechanical properties and prolongs its service life. Alumina nanoparticles (ANPs) and multi-walled carbon nanotubes (MWCNTs) modified PC are found to improvement tensile strength, ductility, and fracture toughness. Further, structural health monitoring (SHM) can be enabled using pristine MWCNTs (P-MWCNTs). Figure 1: TEM images of MWCNTs (left) and ANPs (right). MWCNTs photo credit: Cheap Tubes, Inc.
BACKGROUND: Nanoparticles are materials with characteristic dimensions that lie in the nanoscale. ANPs are Aluminum oxide particles with maximum nominal dimension of 50 nm. MWCNTs are cylindrical nanostructures made of carbon molecules whose diameter is in the nanoscale and are tens of microns long. The MWCNTs used here were of 20-30 nm outer diameter, 5-10 nm inner diameter, and 10-30 μm length. Transmission electron microscope (TEM) images of both nanoparticles are shown in Figure 1. 1. Tensile strength - the material’s ability to resist breaking under tension. 2. Ductility - the material’s ability to deform to failure often represented as strain at failure in tension. 3. Fracture toughness: the material’s resistance to crack propagation. By improving these properties, maintenance frequencies are reduced and degradation is mitigated. ANPs MODIFIED PC: The results show that the use of ANPs in PC provides improved ductility with negligible loss of tensile strength. PC and ANPs modified PC both show high tensile strength in the range of 9.5-11.3 MPa, while normal concrete is often limited to 2-3 MPa. More importantly, ANPs modified PC reached a strain at failure up to 5%, whereas ordinary concrete usually fails at a tension strain lower than 0.1%. Therefore, an order of magnitude improvement in ductility can be achieved using ANPs of up to 3% by weight, as shown in Figure 2. These improvements are reflected in fracture toughness results as well, where ANPs modified PC have up to 131% increase in fracture toughness, as shown in Figure 3. Figure 2: Tensile stress-strain curves for ANP modified PC. Figure 3: Crack mouth opening displacement (CMOD) vs load and energy for ANP modified PC. MWCNTs MODIFIED PC FINDINGS: Two types of MWCNTs were used in this study, namely pristine (PCNP) and carboxyl functionalized (PCNC) MWCNTs. The use of functionalized MWCNTs resulted in increased tensile strength with a small reduction in ductility, whereas pristine samples improved ductility with minimal loss in strength. The results are shown in Figure 4. Fracture toughness of PC incorporating pristine and carboxyl functionalized MWCNTs also improved by 130%. Importantly, great improvements in the mechanical properties were observed at very low MWCNTs contents (0.5 wt.%). It is apparent that ductility, tensile strength, and fracture toughness of PC can be controlled through the functionalization of MWCNTs. The results for fracture toughness are shown in Figure 5. Figure 4: Tensile stress-strain curves for MWCNTs modified PC. Figure 5: Energy release rate for MWCNTs modified PC in fracture investigation. Because of their specific dimension and high electrical conductivity, pristine MWCNTs at 2% weight content are able to provide an electrical network whose resistivity changes with the material’s mechanical damage. Such change enables damage propagation by monitoring electrical conductivity of PC. Figure 6 depicts how such property is capable of capturing mechanical damage in the four-point bending test. IMPACT: Incorporating nanoparticles at low weight content enables making a significant improvement in the properties of PC. High ductility, fracture toughness and tensile strength of PC are achievable using ANPs and MWCNTs, as shown in this brief. Pristine MWCNTs also enable structural health monitoring of PC. PC modified with nanoparticles provides a promising material for bridge deck overlays and highway repair. Such material would require minimal maintenance and would improve the service life of highways. ABOUT THE RESEARCHERS: Dr. Mahmoud Reda Taha is the principal investigator of this project. He is a Professor and Chair of Civil Engineering Department at The University of New Mexico (UNM). Dr. Rafiqul Tarefder is a Professor in the Department of Civil Engineering at UNM and is an Associate Director of SPTC. OVERVIEW: As a Regional University Transportation Center (UTC), the Southern Plains Transportation Center (SPTC) is committed to strengthening the UTC program’s legacy of invaluable contributions to transportation education and workforce development by executing a comprehensive strategy keyed to the complimentary life-long learning themes of higher education, professional development, encouraging new ideas and new entrants to the profession, as well as K-12 outreach. This life-long approach is particularly relevant in Region 6. The region’s underrepresented groups – Hispanic, African-American, Native American and women – are best served by early intervention, targeted higher education, and continuing education. An important element of SPTC’s workforce development effort is the Transportation Regional Internship Program (TRIP). TRIP PARTICIPANTS: Approximately 40 students participate annually in this program to gain valuable professional experience by working for a transportation-related company or for a government organization/agency such as department of transportation. Since State of Good Repair and Climate-Adaptive Freight and Transportation Infrastructure are SPTC’s focus, a diverse set of topics are covered by this regional internship program, including design, construction, testing (laboratory/field), management, compliance, safety and training. Some of the participants’ experiences are highlighted here. Ofelia Olvera Cancio was a student at the University of Oklahoma who worked with an engineering consulting company, EST, in 2014 and 2015, as a summer intern. She recently graduated and gained a full time position with the company. Her internship experience was instrumental to her integration into EST’s bridge division, where she aided in the bridge design and bridge rehabilitation process and submittal of plans for construction. She drafted bridge plans and checked redlines for bridge sheets, bridge quantities, traffic control, shop drawings and boring logs, among many more drawings in a complete set of plans. Josilyn Mitchell and Bradley Bridges successfully completed their internship rotations with the Arkansas State Highway and Transportation Department (AHTD). They gained valuable training. Now they have a better understanding of career opportunities within AHTD and other DOTs. Efren Luevano Lopez is an Engineering major at Oklahoma State University. Efren’s internship was focused on producing all-composite Adsorbed Natural Gas fuel tanks (ANG tank) that meet the requirements of the Federal Motor Vehicle Standards from the Department of Transportation (DOT) at the Oklahoma State University-CleanNG for the purpose of replacing metallic gas tanks. His work involved designing and fabricating noncylindrical tanks that were pressure tested to determine burst pressure standards. Mariana Maldonado is a Civil Engineering major at the University of Texas at El Paso (UTEP). She successfully completed her internship with AIA Engineers, LTD - a consulting engineering firm that provides engineering and construction services for the improvement of transportation systems. She assisted the Texas Department of Transportation (TxDOT) in bridge inspection. Her duties included measuring and documenting information on the scour and under clearance sections of the bridge folder and analysis of bridge supports using manual computations and software-based evaluations. Jose Miramontes III is a Civil Engineering major at UTEP. As a TRIP intern, Jose checked the ADA compliance of 250 curb ramps that were scheduled for construction. His primary responsibility was to evaluate crosswalks to determine whether curb ramps should be added, repaired, or if new sidewalk installation was required. He was involved in taking field notes, conducting measurements and delivering specification-based implementation. Jose also drafted a full plan set and assisted in field quality assurance control for other multi-million dollar projects, including hot mix asphalt, landscaping and chip seal projects. ABOUT THE PROGRAM: More information about TRIP, including sponsors and participants, can be found at http://www.sptc.org in the STUDENTS tab, INTERNSHIPS link. OVERVIEW: Routing and permitting of oversize and overweight (OS/OW) vehicles is a significant issue that needs to be addressed not only in Texas but across the country, as most OS/OW loads travel multiple states before reaching their destination. With the recent growth in energy-related products in Region 6 (such as wind turbines), coordinated efforts toward efficient planning and routing of the OS/OW loads are becoming increasingly important from the standpoint of both pavement preservation and traffic management. (2) evaluate the impact of OS/OW loads to highway pavements and use performance models to predict the service life of the pavements. Since it is open-sourced, it is available readily and flexible. Users can easily customize it according to their needs. Secondly, an analytical model was developed to evaluate the impacts of OS/OW loads to pavements based on the inputs of the existing pavement condition, climate zone, loads of the OS/OW vehicles, as well as the maintenance and rehabilitation history. This task includes consolidating datasets, finding the most accurate regression function, and obtaining the pavement performance model under different scenarios. Three case studies were designed to validate these functions, which include using the same OS/OW level load in different climate zones, using different OS/OW level loads in the same climate zone, and estimating pavement service life reduction at different OS/OW level loads. For illustrative purpose, the regression curves in Figure 2 show the relationship between road age and the pavement condition score for high OS/OW traffic load in four climate zones. Figure 3 shows the road life reduction curves for different OS/OW traffic loads in the same climate zone. These pavement performance models provide a basis for the development of an optimal routing strategy to reduce pavement damage from OS/OW vehicles. APPLICATION: The integrated information on climate, OS/OW traffic loads and frequency, and the existing pavement condition in this tool not only enables optimal routing of the OS/OW vehicles but also, through the analytical models, provides quantitative analysis of the impact of the super loads on pavements. BENEFIT: The architecture of the product was designed with consideration of open source application. In addition to its integrated structure and analytical functions, it is an open code software and thus readily available and easy to customize. The product provides transportation agencies with a web-based tool for optimal routing of the traffic with oversized and overweight loads and analytical models for the assessment of the impacts resulting from these loads. ABOUT THE RESEARCHERS: Dr. Hongchao Liu is the Principal Investigator of this project. He is a Professor in the Department of Civil, Environmental, and Construction Engineering at Texas Tech University. Co-PI of this project is Dr. Sanjaya Senadheera, Associate Professor and the Director of TechMRT at Texas Tech University. Dr. Dayong Wu is postdoctoral research associate and Junxuan Zhao is graduate research assistant at Texas Tech University. Please send inquiries to Dr. Liu (hongchao.liu@ttu.edu). OVERVIEW: This year’s Louisiana Transportation Conference was a great success, hosting over 1,500 participants, 75 vendors/exhibitors and 72 presentation sessions. The conference was held at River Center in Baton Rouge, Louisiana from February 28 through March 2, 2016. One of the highlights of the conference was the special session by the U.S. Secretary of Transportation Anthony Foxx. Louisiana Tech University, a consortium member of the Southern Plains Transportation Center (SPTC), participated in the events. TLC STUDENT PARTICIPATION: The SPTC facilitates Transportation Leadership Council (TLC) student chapters throughout Region 6. A Louisiana Tech University team comprised of TLC students won first place in the Conference’s senior design project competition, outperforming three other local universities (Figure 1). The team’s award-winning project entitled “T.L. James Lake Pedestrian Bridge” was sponsored by the Louisiana Purchase Council. It was incorporated into a senior design course at Louisiana Tech taught by Dr. Henry Cardenas and Dr. Nazimuddin Wasiuddin. Students were supported by their TLC advisor, Dr. Wasiuddin, and the SPTC associate director for Louisiana Tech, Dr. David Hall. SPTC RESEARCHERS PARTICIPATION: Two of the conference sessions were reserved for University Transportation Center (UTC) presentations. SPTC researchers at Louisiana Tech, Dr. N. Wasiuddin and Dr. Jay Wang, delivered three presentations featuring three projects funded by SPTC and Louisiana Transportation Research Center (LTRC). Dr. Wasiuddin presented SPTC Project 14.1-80 on replacement of force ductility test (AASHTO T300) and LTRC Project 11-2B on replacement of Elastic Recovery Test (AASHTO T301). Currently, asphalt emulsions and binders used in asphalt pavements are evaluated by tests and specification that are not directly and fully related to pavement performance. When project outcomes are implemented, these new specifications will improve pavement performance as well as save significant testing time. The Multiple Stress Creep Recovery (MSCR) procedure (AASHTO TP70) at 58°C has been recommended to replace the elastic recovery test (AASHTO T301). At 0.1kPa creep stress, a minimum percent recovery of 25 and at 3.2kPa, a minimum percent recovery of 9 are recommended to identify the presence of polymer, replacing elastic recovery test (AASHTO T301) (Figure 2). It is also recommended that at 58°C, a maximum phase angle of 81° and a minimum MSCR percent recovery (at 0.1kPa creep stress) of 30 can be specified to replace force ductility test (AASHTO T300). These criteria are applicable for emulsion residues prepared according to the low temperature evaporative method specified in ASTM D7497. The research is underway to develop specifications for hot asphalt binder. Another project presented by Dr. Wasiuddin, funded by LTRC, documented the benefits of the innovations implemented in the Highways for Life (HfL) Demonstration Project – LA 511. The project location at 70th Street (Line Ave to Fern Ave, 1.03 mile) in Shreveport, Louisiana is one of the busiest and accident prone highways in the area. Major construction innovations were implemented. Throughout the project the team collected data for friction, noise, density, construction time, roughness, accidents, economic analyses and user satisfaction survey. The life cycle cost analyses show that the baseline case (construction without innovations) is estimated to save approximately $1.27M in terms of 2012 NPV based on a 5-year analyses period. The as constructed (with innovations) case is estimated to save approximately $2.96M. The average user satisfaction ratings before and after construction are 2.78 and 4.42, respectively, in the Likert scale of 5 where 5 is “very satisfied”, which meets the HfL goal. Dr. Jay Wang presented preliminary achievements from project SPTC 14.1-76 for characterizing the expansive soils in northern Louisiana. Understanding unsaturated expansive soil has always been a major challenge for soil scientists and engineers. Research work of fundamental soil index properties, the soil water characteristic curve (SWCC), the shrinkage curve of the expansive soil, and the three-dimensional constitutive surface, etc., were completed. They are significantly important in identifying expansive soil, determining its volume change behavior, and designing highway pavement on the expansive soil. Using soil data from each of the 64 parishes in Louisiana a state-of-the-practice map to show the distribution of expansive soils and their degrees of severity over Louisiana based on the calculated swelling potential was plotted using the ArcGIS software. The Atterberg limits (LL 79; PI 51) and the activity (AC) 1.37 indicated that the soil was highly expansive. Predicted heaves using five different methods were varied as widely as 16% and the swelling potential (SP) of the soil was found to be 7.22%. After comparing the SP values with those achieved in different areas in the USA and around the world, it strongly suggested that the expansive soil in northern Louisiana is one of most expansive soils in the world (Figure 3). ABOUT THE AUTHOR: Dr. Nazimuddin Wasiuddin is an associate professor of civil engineering and construction engineering technology at Louisiana Tech University and advisor for the SPTC Transportation Leadership Council (TLC). Please send inquiries to Dr. Wasiuddin (wasi@latech.edu). OVERVIEW: The Southern Plains Transportation Center (SPTC) is a regional university transportation center focused on climate adaptive transportation and freight infrastructure. An active partner of the SPTC is the University of Oklahoma Center for Intelligent Transportation Systems (OU-CITS). OU-CITS was established in 1998 as the OU ITS Lab – a joint venture between the Oklahoma Department of Transportation (ODOT) and the OU School of Electrical and Computer Engineering. OU-CITS has assisted ODOT with the design and integration of Oklahoma’s statewide intelligent transportation system (ITS) since the beginning of that program. In cooperation with ODOT, OU-CITS implemented the first fully distributed, virtual Traffic Management Center. OU-CITS members share their expertise through training transportation agents in ITS technology. OU-CITS also works closely with other transportation stakeholders including the Oklahoma Department of Public Safety and municipal police agencies. Recently, OU-CITS collaborated across state agencies in the cooperative development of a Traffic Incident Management system as part of the statewide implementation of ITS (Figure 1). Additionally, the collaboration has produced a related research project that involves using connected vehicle technology to improve traveler safety in inclement weather. The collaboration between the OU-CITS and the SPTC is, therefore, unique in that the collaborative projects range from pure research to real deployment of systems. PRODUCT DEVELOPMENT: The SPTC has facilitated and supported a collaborative effort between the OU-CITS, ODOT and the USDOT’s Traffic Safety Institute (TSI) in Oklahoma City to create training materials in the ITS area. Under the USDOT’s training mission, TSI provides multi-modal transportation safety training across the country. These modules consist of three key ITS areas, namely passenger vehicles, commercial vehicles and transit, and will be delivered by TSI in their training courses nationally to transportation professionals from Federal, State, and local government agencies, and the private sector. The most significant product, so far, resulting from this collaboration is a Case Study entitled “ITS in Severe Weather Incident Management.” This case study ties closely to the SPTC’s focus on Climate Adaptive Transportation and Freight Infrastructure. The SPTC, OU-CITS and ODOT provided their domain expertise in developing this case study. The “ITS in Severe Weather Incident Management” case study is based on the experiences of transportation agents from the May 2013 extreme weather events in Oklahoma. On May 19-20, 2013, Central Oklahoma was struck by a number of tornadoes, including an EF5 tornado that struck Moore, OK on the afternoon of May 20 (Figure 2). According to the Oklahoma Department of Emergency Management, this single tornado in the southern portion of the Oklahoma City Metropolitan area killed 24 people and caused an estimated $2 billion in damages (Figure 3). Many of the challenges introduced in the case study were faced by transportation engineers in the early aftermath of the May 20th severe weather event. Highways were blocked by damaged vehicles and some ITS infrastructure was damaged or destroyed (Figure 4). In addition to direct damage, electrical outages caused loss of power to several permanent ITS resources. Overloading of cellular networks caused communication difficulties. Information Systems (ATIS, shown in Figure 1), and other resources to inform motorists about safety hazards and re-route interstate highway traffic during and in the aftermath of a major extreme weather event. As part of the case study, these teams meet on a second day to discuss their response. One of the unique aspects of this case study, “ITS in Severe Weather Incident Management,” is the set of secret envelopes. These envelopes give team members their own set of unique and unexpected challenges and provide dynamic complications that transportation engineers face in responding to disaster events and demonstrates the need for flexibility. While this study focuses on a tornado event, the challenges and approaches introduced are applicable to a variety of severe weather events including flooding and hurricanes. PRODUCT IMPLEMENTATION: The case study was tested by Civil Engineering students in their Transportation Engineering course in the Spring of 2016. The participants provided a strong and positive feedback on the effectiveness of the case study. It will next be presented to engineers from ODOT’s Maintenance Division. In addition to the three ITS training modules, the SPTC and OU-CITS look forward to future opportunities to share their experience and expertise through collaboration with TSI and the development of training materials. These modules are expected to enhance driver safety and have local, regional and national impacts in the training of transportation professionals who manage severe weather incidents. This effort was led by Joseph Havlicek, Williams Presidential Professor in School of Electrical and Computer Engineering and Director of OU Center for Intelligent Transportation Systems and Ronald Barnes, Gerald Tuma Presidential Associate Professor in School of Electrical and Computer Engineering and Co-Director of OU Center for Intelligent Transportation Systems. Please send inquiries to joebob@ou.edu or ron@ou.edu. MISSION STATEMENT: The Transportation Leadership Council (TLC) Student Chapter at The University of Texas at El Paso (UTEP) encourages students of all disciplines interested in the ever encompassing transportation field to develop technical and professional skills needed to succeed in their careers. Through professional guest speaker lectures, technical tours, student paper presentations, and career-building workshops, UTEP students not only enhance their learning experience but also foster the growth of strong teamwork, leadership, and networking skills. INTRODUCTION: UTEP has developed the TLC leadership organization with help from the SPTC and The Center for Transportation Infrastructure Systems (CTIS) (Figure 1). The TLC is student-driven and encourages research in the area of transportation. The Chapter was launched in January 2016 and has 35 members, 6 officers, one student advisor and 3 faculty advisors. Monthly meeting The TLC Student Chapter conducts monthly meetings that include transportation-related activities such as hosting professional presentations from local industry and providing information about scholarship/fellowship opportunities and volunteer events. Seminars TLC promotes seminars that create an opportunity to explore topics more in-depth while sharing ideas in a way that will inspire students to think outside of the box. Students who attend the seminars are exposed to the ongoing research in the transportation area and gain a different perspective about conducting research to pursue a Master or a Ph.D. degree (Figure 2). Lab Tours TLC members provide tours of the CTIS material testing and research laboratories, Soil Lab and Asphalt Lab, for students and teachers from local schools to demonstrate research in transportation (Figure 3). These tours motivate high school students to enroll in civil engineering programs. In addition, these tours help the TLC members develop communication skills. In April 2016, the TLC members provided tours for students from El Paso High School and visitors from the University of Guadalajara, Mexico for US-Mexico Bidirectional Study Abroad Program on Smart Cities. TRB Annual Meeting Three officers and eight members of TLC attended the Transportation Research Board (TRB) 95th Annual Meeting (2016) to learn about the ongoing research in the transportation sector (Figure 4). Amongst those students, TLC’s President, Prajwol Tamrakar said, “The experiences and knowledge that I gained at TRB enhanced my research capability and my professional development”. UTEP L.I.V.E. TLC members attended the UTEP L.I.V.E. Event on Friday, February 26th. UTEP L.I.V.E. is a university-wide student award that provides students with opportunities to create a leadership development experience while networking with students and professionals in diverse areas. Professional Mixer On Thursday, April 7th, 2016, TLC invited a group of companies to UTEP for a networking event. During this event, students had the opportunity to talk to local professional engineers, in an informal setting, about the civil engineering work force and about possible summer internship opportunities. Project Move TLC has partnered with Engineers Without Borders (EWB) – UTEP Student Chapter to participate in Project MOVE, a university-wide event in which students perform community service events all over the city of El Paso. Food Drive In May 2016, many non-profit organizations were involved in a food drive program. As a part of community service, TLC also launched a food drive program at UTEP to support people in need. The collected food was donated through the local USPS office. The officers at the USPS office appreciated the efforts of TLC for serving El Paso community. SPTC paper and poster competition TLC nominated four UTEP students for 2016 SPTC Student Paper and Poster Awards. These awards have been established to recognize scholarly research contributions made by students in engineering or a closely related field on transportation. Two students, Mr. Victor Garcia and Ms. Alejandra Escajeda, received the award (Figure 5). Victor is a graduate student and research assistant at CTIS working toward his Master’s degree in civil engineering. He received this award for his paper titled “Understanding Sources of Variability of Overlay Test Procedure.” Alejandra is an undergraduate student and research assistant at CTIS working toward her bachelor’s degree in civil engineering. She was awarded for her poster titled “Service Life of Hot Mix Asphalt using PERMIT”. Support to Students TLC was established to promote transportation related research, to link academic path with industry, to provide a platform for students to learn, share and network, to inspire students in research oriented activities, and more. As a part of professional development of students, TLC plans to support students for attending conferences and professional workshops. Recently, TLC sponsored Ms. Andrea Gutierrez for attending the International Conference on Transportation & Development 2016 at Houston, Texas. Andrea is an active member and student advisor of TLC. For additional information about the TLC chapter at UTEP, please contact Imad Abdallah at emadn@utep.edu. OVERVIEW: Rutting (permanent deformation) is a major concern in asphalt pavements due to the unrecoverable cumulative deformation that occurs in the wheel path under high temperatures as a result of repeated traffic loading. The depression is mostly due to compaction while the lateral movement happens as a result of the shear failure (Figure 1a). Moisture damage also causes distress in asphalt pavements. It is the progressive deterioration of asphalt mixes caused by loss of adhesion between asphalt binder and aggregate surface and/or loss of cohesion within the binder primarily due to the action of water (Figure 1b). The objective of this research project is to measure and minimize the impact of rutting and stripping on asphalt concrete pavements. The work builds on the collaboration between researchers at the University of New Mexico (UNM) and the New Mexico Department of Transportation (NMDOT), which involves testing and interpretation of laboratory data to assess the effectiveness of the Hamburg Wheel Tracking Device (HWTD) testing criteria and develop specifications needed for proper testing and implementation of HWTD in New Mexico. To understand the rutting susceptibility as well as the moisture susceptibility, the current study investigates performances of asphalt cement (AC) mixes using the Hamburg Wheel Tracking Device, shown in Figure 2. This machine measures the combined effects of rutting and moisture damage by rolling a steel wheel across the surface of an AC specimen that is immersed in hot water. Traditionally the tests have been performed underwater at 50°C and each set of samples are loaded for 20,000 passes or until 20 mm of deformation occurs, whichever comes first. There are no defined standards for HWTD testing. Several transportation agencies have adapted their own specifications for HWTD testing, which differ in testing temperature, conditioning time and frequency of loading. Varying test conditions result in variability of HWTD test results among state agencies. 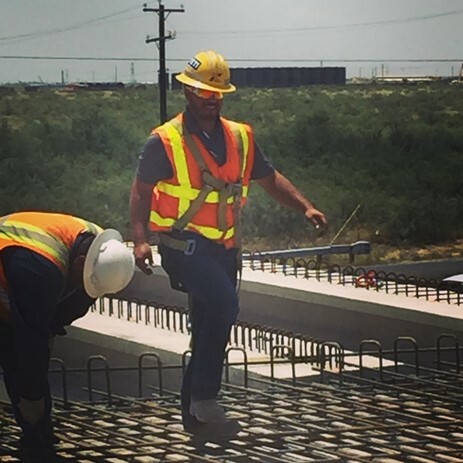 Furthermore, due to climate and material variability used in pavement construction between different regions, a separate specification is needed to determine the suitability of HWTD in New Mexico. FOUNDATIONAL RESEARCH: Extensive HWTD tests were conducted on Hot Mix Asphalt (HMA) and Warm Mix Asphalt (WMA) mixes collected from asphalt plants or paving sites located in various regions of New Mexico. The laboratory test results provided important insights into the susceptibility to permanent deformations to mix temperature, aggregate type and binder type. 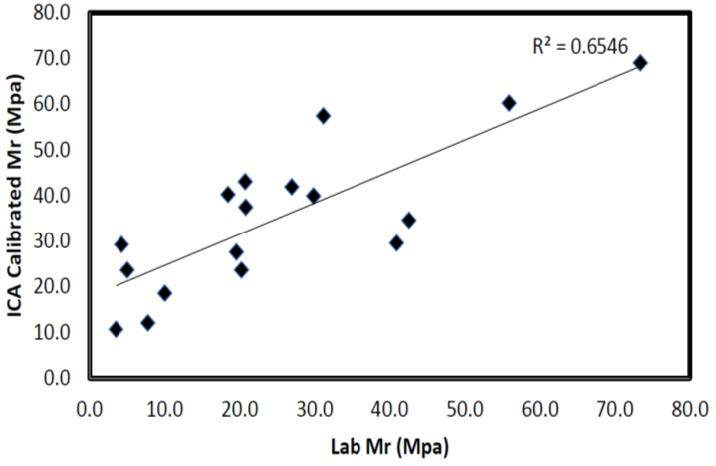 A total of 14 mixes, varying in composition of aggregate type, gradation, binder type, anti-stripping agents, Reclaimed Asphalt Pavement (RAP) content, and WMA additives or agents were tested and the generalized results are shown in Figure 3. Among the 14 mixes, only Mix 6 and Mix 7 reached the stripping phase and were not able to finish the 20,000 passes. Both mixes were in presence of unique aggregates of shale and dacite, respectively. In addition, these mixes were finer mixes due to finer gradation. On the other hand, mixes which consisted of a coarser gradation and harder aggregate types, such as basalt and quartzite, tended to perform better against rutting and showed no signs of stripping susceptibility. Mix 8 to and Mix 12 have the same properties in terms of aggregate type, gradation, binder PG-grade, etc. These mixes only differ in the type of HMA/WMA technology. Among the tested mixes, Mix 12 with WMA agent of Cecabase RT and polymer modified binder (PMB) showed a significant decrease in the rutting susceptibility. CURRENT RESEARCH: While many important lessons were learned from previous research done by testing and data interpretation of the tested mixes, it is necessary to extend the results to better understand the rutting and stripping susceptibility of AC mixes due to material variability and testing conditions. Aggregate has become an important contributor to the performance of asphalt mixes since it is a primary component of the mix. Aggregate mineralogy and durability properties are key in determining the influence of aggregates in HWTD testing. Aggregate type is closely related to permanent deformation (rutting) since its composition influences the behavior of this distress. The interplay between aggregate type, binder type and temperature have a direct influence on a mix’s susceptibility to rutting and stripping. UNM researchers with the support of SPTC are investigating the effects of aggregate, binder PG grade, gradation, WMA agents and PMB’s in HWTD. The results of this extensive analysis of the mentioned factors will be beneficial for future mix designs by NMDOT. Dr. Rafiqul A. Tarefder is the Principal Investigator on the project. He is a professor in the School of Civil Engineering at the University of New Mexico. Please send inquiries to tarefder@unm.edu. OVERVIEW: Alkali-silica reaction (ASR) is an expansive reaction between the alkalis in the cement and reactive silica in the aggregate particles. Arkansas is currently witnessing the detrimental effects of ASR at various locations within the state. These locations include many miles of interstate pavements and interstate barrier walls (locations in both Central and Northwest Arkansas). A petrographic analysis of samples from select locations has confirmed that ASR is present. Current research at the University of Arkansas has shown that concrete expansion due to ASR may have been exacerbated by the extreme weather changes that Arkansas has experienced during recent winters. This weather change has resulted in freezing and thawing cycles in both the pavement and barrier wall and has caused further deterioration. Therefore, prevention and mitigation measures must be developed. This project examines the effectiveness of silane and other potential sealers in stopping ASR in concrete structures. The reaction between the cement and aggregates takes place when the highly alkaline pore solution corrodes and dissolves reactive siliceous minerals within the aggregate particles. The reaction between cement and aggregate is controlled by two factors. First, the cement alkali levels, which are reported as total alkali equivalents, control the alkalinity of the cement pore solution. Second, the presence and composition of reactive siliceous minerals within the aggregate particles determines the rate of reaction. An additional factor, which influences the development of alkali-silica gel, is the presence of calcium within the pore solution. For expansion to occur within the alkali-silica gel, a sufficient source of moisture must also be available. One of the major objectives of this project is to reduce the internal relative humidity by applying silane to the ASR infected concrete. Silane is a penetrant that bonds to the surface of the concrete and forms a hydrophobic layer, which blocks liquid water from entering the concrete while allowing water vapor to escape. Over time, the silane treatment dries the concrete towards equilibrium with the surrounding air. If the internal relative humidity of the concrete drops below 80 percent, expansion will slow or cease. The research program is using silane and other topical applications to reduce the internal relative humidity of concrete structures infected with ASR. The project is divided into two phases. In the first phase, expansion in the barrier wall and pavement is being monitored. Silane and other topical treatments have been applied to the barrier wall (Figure 1) and pavement. The barrier wall is instrumented so that expansion and relative humidity can be monitored. Expansion data (shown in Figure 2) of the moderately damaged section of the barrier wall show the effectiveness of the silane. The sections treated with two applications of silane (labeled S2-2 in Figure 2) experienced approximately 50 percent less expansion than the control section. In the laboratory phase (second phase of the project), field exposure blocks containing reactive silica were cast (Figure 3). Each block was instrumented so that expansion and relative humidity could be monitored. These blocks were treated with silane and other sealers to determine the most effective treatment that can mitigate ASR expansion by reducing internal relative humidity. APPLICATIONS/IMPACT: The application of the results will improve the understanding of the effects of silane and other potential surface treatments on ASR infected concrete that are also subjected to extreme weather events. The research will also help determine the dosage rates and application frequency for silane and other potential surface treatments. The impact of the research is visible on the barrier wall. As shown in Figure 4, the control section, Section A, of the barrier wall exhibits more distress than the section treated with silane, Section B. Section A was left untreated, and two applications of silane was applied to Section B approximately three years ago. If left untreated, Section B would now resemble Section A. BENEFITS: Applications of the findings are expected to increase the service life of concrete structures that exhibit distress caused by ASR and freezing and thawing. Micah Hale, Ph.D. P.E. is the Principal Investigator on this project. He is a Professor of Civil Engineering at the University of Arkansas. Richard Deschenes, Jr. is the graduate research assistant (University of Arkansas). Richard is a recipient of the Eisenhower Fellowship and the ACI BASF Construction Chemicals Student Fellowship. OVERVIEW: Langston University hosts the Langston University Transportation Academy (LUTA) annually. The primary objective is to attract a diversified group of young people into the transportation workforce. Few minorities enter transportation professions. To increase diversity of future transportation professionals in the United States, it is necessary to deliver intervention efforts that are geared toward encouraging underrepresented students to take science, technology, engineering and mathematics academic courses. It is advantageous for young people to be recruited early in secondary school and exposed to career choices and opportunities in the transportation industry. Therefore, the academy has three related objectives: (1) to create awareness of and stimulate interest in career opportunities in the transportation industry for secondary school students; (2) to attract a broad and diverse selection of bright minds, and acquaint and stimulate them with the various aspects of the transportation industry; and (3) to increase the number of students who choose careers in the transportation industry. Figure 1 shows LUTA students. LUTA curriculum generally involves learning about land, air, water, and space transportation, and how these modes of transportation interface with each other. Also, students hone their computer, math, chemistry, and communication skills. Promoting fast, smooth, and safe transportation is one of the underlying themes of the Langston University Transportation Academy. During the recent LUTA, students visited the Oklahoma Department of Transportation (ODOT), where they learned about bridge design, roadway design and construction, and testing of concrete and reinforcing steel used in road construction (Figure 2). Students also learned about the planning process in road and bridge construction and about the importance of science in constructing safe and durable roads and bridges. Students visited the Oklahoma City Metro Aviation Career Center where they learned about the history of aviation and aviation technician careers. They also visited the Tulsa Air and Space Museum to learn more about air transportation, and a little more about the connection to Oklahoma. At the museum, students engaged in flight simulation. To learn about water transportation careers, students visited the Tulsa Port of Catoosa. The Port is an inland multi-modal bulk shipping complex and industrial park, which includes the Maritime Education Center. Most of the space is leased to other companies involved in manufacturing, processing, and transportation industries. Students were given a tour of the facilities. At the Maritime Education Center, students engaged in self-directed learning activities through video presentations about the history, economic, and environmental impact of the Port. Students learned that for each day the port were to close, Oklahoma would lose $2 million. The Federal Railroad Administration presented information to academy participants that included careers in the railway industry and the various companies that operate in Oklahoma. Participants learned that railroads are privately owned and operated and play an important role in transporting people and goods. The Federal Railroad Administration presented information to academy students that included careers in the railway industry and the various companies that operate in Oklahoma. Students learned that railroads are privately owned and operated and play an important role in trans-porting people and goods. Students visited the Midwest City Police Department where they learned about the dangers of driving while drinking or under the influence of drugs. The various tests given to people suspected of being under the influence were demonstrated. Figure 3 shows an exercise that involved students driving go-karts. First, carts were driven under normal conditions to simulate sober driving; then the karts were adjusted so that reaction time was slowed to simulate reaction time for impaired driving. Students also learned about safe driving through a six-hour Defensive Driving Workshop facilitated by First Gait Enterprise. This workshop provided real examples of families that were impacted by the loss of children, family members, and friends as a result of accidents that could have been prevented. Students learned how to recognize road hazards, scope the environment, and be proactive in avoiding unnecessary deaths, especially those of young people. Two of the students’ parents participated in the workshop, and together with eligible students earned a certificate that could be provided to their auto insurance agents to possibly reduce their premiums. Other LUTA highlights included a visit with Dr. Kent Smith Jr., president of Langston University, who encouraged students to take advantage of programs, like LUTA, and to follow their passion. He told them not to follow the crowd, but to focus on accomplishing their dreams. “Don’t waste time listening to someone who will not help you to accomplish your goals.” Dr. Smith encouraged the students to academically prepare themselves because opportunities are awarded to the prepared. Students kept journals of what they learned each day. At the end of the program, students were asked to write an essay on what they expected to learn, what they actually learned, and what they thought they would do in the future as a result of being part of the Academy. Responses helped to validate the LUTA strategy. D. Chongo Mundende of Langston University is the LUTA Director. Please send inquiries to dcmundende@langston.edu. OVERVIEW: Researchers at the Texas Tech T-STEM Center in the Edward E. Whitacre Jr. College of Engineering in collaboration with the Department of Civil, Environmental and Construction Engineering conducted two Teacher Professional Development Workshops focusing on Transportation in July 2014 and July 2015 (Figure 1). These workshops were sponsored by the Southern Plains Transportation Center (SPTC) through the project entitled “STEM Teacher Professional Development – Transportation Series/Student Outreach and Education.” In these workshops, K-12 science and math teachers were provided professional development training directly related to transportation industry applications. Texas Tech faculty, researchers and graduate assistants developed and conducted several teaching modules related to transportation that were customized to middle school and high school science and math classes. The workshop was facilitated by a Texas-certified science teacher with more than thirteen years teaching experience in rural and urban schools, and who frequently presents at state and national science conferences. Students and teachers in Region 6 will benefit from the implementation of these workshops. During these workshops, teachers received instruction and products related to various topic areas. Demonstrations were provided on cutting-edge transportation research in formats applicable to instructional techniques for use in science and math classrooms. Teachers also gained a deeper understanding of how transportation infrastructure is designed and built; a sneak-peek at the future of transportation infrastructure landscape; instructional content on highway design and performance, driver behavior, traffic safety and future of surface transportation; project-based learning exercises related to sight distance, space between successive vehicles, horizontal and vertical curves, traffic safety, pavement design and material selection, earth-retaining structures and the future of surface transportation; materials in transportation infrastructure for math, physics, chemistry, technology and ecology lessons, and “hands-on” projects that can be differentiated for the classroom (Figures 2 & 3). IMPACT: In the first workshop, eight high school, middle school and elementary math and science teachers from Lubbock and the surrounding areas participated. Teachers traveled from Olton, Texas, one hour north of Lubbock, to as far away as Presidio, Texas – in the Rio Grande, located on the Texas/Mexico border – about six hours south of Lubbock. The participating teachers serve elementary, middle, and high schools in math and science classes plus Pre-calculus, Geometry, Algebra 1, Algebra 2, Physics, IPC, Dual Credit Algebra, Trigonometry, SAT Prep, Social Studies, Robotics, and Math Models. Data collected by the Texas Tech T-STEM Center shows that a total of 743 students are reached by these eight teachers. A demographic breakdown of 53.3% Hispanic, 39.7% White, 3.6% African American, 1.3% Asian and 1.5% from two or more races, with 51.5% of all students classified as economically disadvantaged. In the second workshop, eleven teachers participated in the two-day workshop, representing seven high schools and four middle schools in the seventeen-county Lubbock region. Subjects regularly taught by the participating teachers include: Middle School Math, Algebra I, Algebra II, Geometry, Calculus, Computer Applications, Biology, Anatomy & Physiology, Chemistry, Physics, Social Studies, IPC and Engineering. Data collected by the Texas Tech T-STEM Center shows that a total of 898 students are learning from these eleven teachers with the student demographic breakdown indicating 56.5% Hispanic, 38% White, 2.9% African American, 0.7% Native American, and 0.4% two or more races. It is also important to note that 48.1% of these students are classified as economically disadvantaged as well. The Texas Tech T-STEM Center used workshop pre- and post-tests to assess the effectiveness of teacher learning and were designed to meet compliance requirements of the Texas Tech University Human Research Protection Program (HRPP) protocol/policy. In addition, the Teacher Professional Development Workshops pre- and post-tests were designed to be content-specific based on learning objectives for each workshop. Data showed that the transportation workshop participants achieved an 81.8% significant gain in learning. In all Teacher Professor Development Workshops conducted by the Texas Tech T-STEM Center in the 2014-15 year, a total of 516 teachers completed various workshops, 491 teachers achieved significant gains in knowledge illustrated by a 95.2% aggregate significant gain indicator. Course and instructor evaluations provided by the trainees (teachers) provided valuable insights on the effectiveness of the second workshop. Overall, the evaluations were very positive with particularly overwhelming positive feedback for the faculty who conducted the training. Ms. Cathy H. Allen, Senior Director of Texas Tech T-STEM Center is the principal investigator of the project. The Co-PIs are Drs. Hongchao Liu, Priyantha Jayawickrama and Sanjaya Senadheera. The workshops were supported by all faculty members in the Department of Civil, Environmental and Construction Engineering. The workshops were conducted by Ms. Cathy H. Allen of the Texas Tech T-STEM Center along with Dr. Wesley Kumfer (postdoctoral research fellow and winner of the 2015 SPTC Student of the Year award), Dr. Sangwook Bae (Assistant Professor), Dr. Hoyoung Seo (Assistant Professor), Dr. Sanjaya Senadheera (Associate Professor), and PhD students Tharanga Dissanayake and Manil Hettiwatte, all from the Department of Civil, Environmental and Construction Engineering. OVERVIEW: Hydroplaning on pavement occurs when water pressure builds up in front of a moving tire resulting in an uplift force sufficient to separate the tire from the pavement. Occurrence of hydroplaning is highly associated with several factors, including pavement texture, cross slope, longitudinal grade, pavement width, pavement type, pavement condition, tire characteristics, and rainfall intensity. The loss of steering and traction force produced during hydroplaning may cause a vehicle to lose control. Historically, effects of pavement slope on vertical wheel load and relevant hydroplaning speed prediction have not been investigated, nor the related safety issues. Therefore, the present study uses an innovative technology, called PaveVision3D (Figure 1) available at Oklahoma State University (OSU) to: (1) properly predict hydroplaning speeds on pavement with large slopes using hydroplaning prediction model; (2) calibrate the Inertial Measurement Unit (IMU) used to measure cross slope by eliminating the effects of vibration of the survey vehicle; and (3) identify the potential hydroplaning segments in network level survey to enhance safety. Previous studies indicate that the risk of hydroplaning increases with the exaltation of the Water Film Depth (WFD), which is dependent on surface texture properties, flow path slope, flow path length, rainfall intensity, and pavement surface type. It is evident from the literature search that very few studies have been conducted to investigate surface drainage of pavements at network levels. This is due to existing data acquisition systems being incapable of continuously measuring related data sets at high speeds. Using the 1mm 3D PaveVision3D Ultra technology (illustrated in Figure 2), texture data are continuously collected at high speeds, while the cross slope and longitudinal grade data are acquired with an Inertial Measurement Unit (IMU). Data collected at highway speed are fed into the widely used PAVDRN model to calculate hydroplaning speed, and the potential hydroplaning performance of the pavement. Figures 3 and 4 show the predicted hydroplaning speeds based on the PAVDRN model at two test sites. At test site 1 (Figure 3), the speed limit is 35 mph (represented by the solid line). The predicted hydroplaning speeds across the entire section (represented by symbols) are much greater than the speed limit, which indicates that there is no potential hydroplaning at this site if drivers abide by the speed limit. At test section 2, the speed limit is 45 mph. Hydroplaning might occur within the segment ranging from 1080-ft to 1185-ft (indicated by the data shown by the solid line), where the predicted hydroplaning speed is lower than 45 MPH (Figure 4). Findings show that pavement segments with potential hydroplaning risk can be identified by comparing predicted hydroplaning speeds with a given posted speed limit. Hydroplaning speeds at pavement segments with large slopes are lower than that at pavement segments with no grades. Moreover, by considering effects of cross slope and longitudinal grade on wheel load and flow path length, hydroplaning speed decreases with an increase in the longitudinal grade, but increases with an increase in the cross slope. APPLICATION: The application of the results provide a way to integrate the real-time 1mm 3D pavement texture data and IMU data into the improved models for potential hydroplaning prediction of sloping pavement through a network level survey. This will allow pavement engineers to identify potential hydroplaning risk of a pavement’s segment, based on the predicted hydroplaning speed and posted speed limit, so that corrective measures can be taken (e.g., constructing superior texture, posting proper speed traffic signs). Additional related work is currently underway, including collecting 3D pavement surface data for High Friction Surface Treatment (HFST) sites in several states to monitor long-term performance of the safety enhancing technology being implemented by FHWA. BENEFITS: Application of results is expected to reduce potential traffic accidents caused by hydroplaning and enhance driver safety. Dr. Kelvin C.P. Wang, Ph.D., P.E. (Oklahoma State University) is the Principal Investigator on this project. He has been developing the PaveVision3D technology since 2000 with funding from USDOT’s UTC program, FHWA, FAA, Arkansas DOT and Oklahoma DOT. Please send inquiries to Dr. Wang (kelvin.wang@okstate.edu). OVERVIEW: Students and teachers in Region 6 are benefiting from using fun, fact-filled activities through the development of curricular materials for high school and college-level students. A few of the activities associated with a project entitled “Technology-Rich Transportation Engineering Projects” are included in this brief. ENGINEERING AND SCIENCE DAY: Approximately 500 students from 15 high schools attended Engineering and Science Day at Louisiana Tech University on April 15, 2015. Engineering and Science Day provides a venue where high school students can learn about engineering and science majors and careers. Groups of 25 to 35 students participated in an SPTC-sponsored activity focusing on transportation and traffic engineering. Dr. Norm Pumphrey talked with the students about various modes of transportation, the different focus areas that define the field of transportation engineering, and about the critical importance of safe and reliable transportation systems to support society. After the presentation, teams of four to eight students were invited to compete by racing remote controlled cars on a race track with various obstacles, including a steep slope, sharp turns, bumps and public safety hazards, as shown in Figure 1. PRE-COLLEGE ENRICHMENT AT PRAIRIE VIEW A&M: For many years Prairie View A&M University (PVAMU) has sponsored the Pre-College Enrichment Institute (PCI), a two-week residential summer program, for talented high school students. The mission for PCI is to assist students in making early plans to pursue a college education in an area that interests them most. Minority Introduction to Engineering and Science (MITES) is offered to highly competitive students interested in engineering, engineering technology, computer science, physics, chemistry and mathematics. MITES is co-sponsored by the Roy G. Perry College of Engineering at PVAMU. On May 25, Dr. Sanjay Tewari from Louisiana Tech University, with the help of Dr. Raghava Kommalapati from PVAMU, was able to connect with PCI-MITES to introduce the students to transportation engineering as part of his SPTC-funded project. Dr. Tewari talked about career opportunities in transportation as well as what transportation might be like in the future. This interaction with the students provided the background needed for students to participate in a small scale simulation focused on transportation and traffic engineering fundamentals. They raced remote controlled cars on the track shown earlier in Figure 1. Afterwards students shared their experiences and participated in an interactive discussion on the role of science and engineering in overcoming societal challenges. EXXON-MOBIL BERNARD HARRIS SUMMER SCIENCE CAMP: The Exxon-Mobil Bernard Harris Summer Science Camp (EMBHSSC) was hosted during June 14-26 at Prairie View A&M University to provide activities, experiments, projects, and field experiences for students entering 6th, 7th, or 8th grade in the fall of 2015. The camp promotes science, technology, engineering, and mathematics education and supports historically underserved and underrepresented students with limited opportunities. Grade 5, 6, or 7 students who have an interest in science and mathematics and at least a B average in science and mathematics were eligible. The recruitment area of this camp covered 11 different counties in Texas (Austin, Burleson, Brazos, Colorado, Fayette, Lee, Grimes, Montgom-ery, Waller, Washington and Wharton). Dr. Kommalapati was once again instrumental in connecting Dr. Tewari with EMBHSSC. Dr. Tewari interacted with approximately 60 students who were part of this camp and provided a presentation focused on transporta-tion engineering, including career opportunities in transportation. These students also participated the racing activity shown in Figure 1. TEACHERS TAKING ON TRANSPORTATION: Thirteen North Louisiana high school teachers took part in a three-day workshop at Louisiana Tech University this summer to gain hands-on experience in projects that could be implemented in the classroom to expose students to the fun and high-tech side of transportation engineering and related careers. The workshop team guided teachers through six activities designed to give context to fundamental topics and increase awareness of transportation engineering. The teachers used radar guns to measure vehicle speeds from several different angles. This data was used to talk about vectors and trigonometry. The teachers also used the radar guns to conduct a speed study, giving them another set of data and a context for looking at statistics. Other activities included a study of water runoff, experiments to determine friction coefficients of a tire on wet and dry pavement, an analysis of traffic noise using a digital sound level meter, and an egg crash car competition where the participants had to design a safe barrier to absorb the energy of an egg car crash. At the end of the work-shop, the teachers developed plans for implementing the activities at their own schools. Each teacher received two radar guns, a digital sound level meter, a digital force sen-sor, and a variety of other supplies to help implement the projects at their school. Four of the faculty members involved in this project are from Louisiana Tech University, including Drs. Sanjay Tewari and Norman Pumphrey (civil engineering) and Drs. Marisa Orr and David Hall (mechanical engineering). Dr. Raghava Kommalapati is a faculty member in civil and environmental engineering at Prairie View A&M University. Please send inquiries to stewari@latech.edu.